Just read: 'It's Your Ship' by Captain Mike Abrashoff — Sorry, Internet. Since I was hired at DIRECTV in May 2015, and since DIRECTV was acquired by AT&T only a few short months after, the company has been through several departmental re-organizations. The running tally amounts to an average of one and a half or two re-orgs per year since I joined the company. But throughout all that shifting, my focus has remained mostly the same -- up until recently, I was responsible for digital content strategy with a focus on marketing and messaging in the effort to acquire new DIRECTV subscriptions. 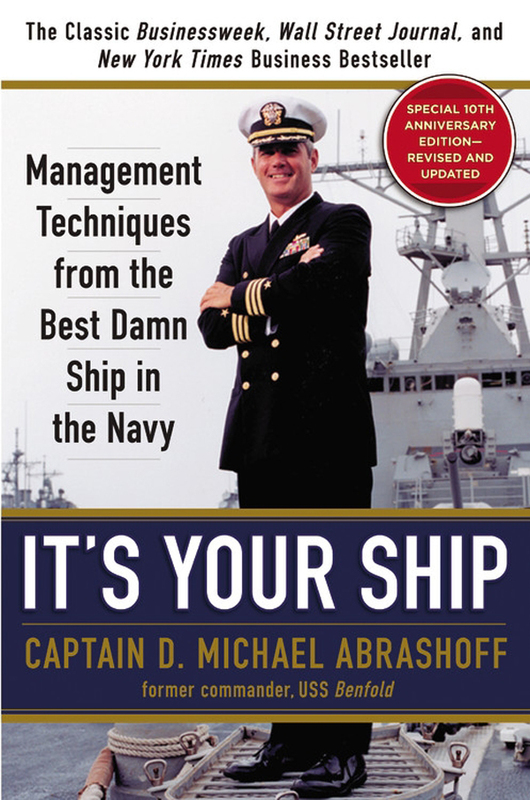 It's Your Ship was written by Captain Mike Abrashoff, and he primarily discusses management tactics that he employed while he was the officer in charge of the U.S.S. Benfold for two years in the 1990s. While his experience was now nearly 30 years ago, the pillars of management he focuses on are still relevant today -- and it's hard to imagine them ever really going out of style so long as large corporations need middle-ish level managers. Even with my relative lack of experience in leadership roles, it's pretty clear that Abrashoff doesn't re-write the rulebook here by any means. While his tactics might be pretty basic and broad for more experienced managers, I found it to be a rewarding read for a first-time manager like myself; those with several years under their belt would likely view this as more of a refresher course than anything else, though. "Listen aggressively," in Abrashoff's words, to your employees . You never know who will think up the next great idea that could improve business-as-usual processes or that could lead to your biggest accomplishment of the month. "I decided that my job was to listen aggressively and to pick up every good idea the crew had for improving the ship’s operation. Some traditionalists might consider this heresy, but it’s actually just common sense. After all, the people who do the nuts-and-bolts work on a ship constantly see things that officers don’t." I'm fortunate that my leaders at AT&T have always been responsive to good ideas from anyone and everyone; I've extended this ear in my work so far at the company by regularly taking suggestions from other teams on how we could improve a variety of marketing pages that I maintain. Encourage ownership. Lay out the parameters for the members of your team, then let their individual talent and dedication go to work. "When people feel they own an organization, they perform with greater care and devotion. They want to do things right the first time, and they don’t have accidents by taking shortcuts for the sake of expedience." And another one: "The Benfold watchword was, 'It’s your ship.' Every sailor felt that Benfold was his or her responsibility. Show me an organization in which employees take ownership, and I will show you one that beats its competitors." This makes for a more effective team and enables a manager to avoid the role of babysitting team members -- an obvious enough win-win. Think like your boss, but see your team through the eyes of your employees. I wish I had read this bit of advice years ago, because it's something that applies to all levels of employees. Putting yourself in your boss's shoes as best you can will give you the clearest idea of what exactly your boss needs from you at the moment and in the long-term. "You have to train yourself in leadership, and you can’t afford to wait until you get promoted to begin the process. While you’re still an individual contributor, learn to think like your boss, so when the day comes to be a leader, you’re ready to step right in with your game plan in hand." Seeing the organization through the eyes of your employees is crucial, as well: It's the only way to figure out what's wrong and identify ways in which you can empower your people to fix those problems. Take calculated risks. This goes for employees all across the organization, managers or otherwise. When you understand the parameters in which you're allowed to operate, and when you can think like your boss, you'll usually immediately know whether or not a certain risk is worth taking. This also means being open to approving ideas even if they don't have any data behind them -- though I personally take this with a grain of salt, the advice is sound: "Since, by definition, new ideas don’t have metrics, the result is that great ideas tend to be stillborn in major companies today. I just knew where Benfold was when I arrived, and generally where I wanted us to go from there. If I had been forced to chart a course defined by metrics, the creativity we sparked and the changes we achieved probably could not have happened." Reward the risk-takers. Even when a risk falls flat, the creative thinking behind that risk should be nurtured. Risk-takers can help push the envelope, making your team more productive and making your team shine brighter. "Unfortunately, organizations all too often promote only those who have never made a mistake. Show me someone who has never made a mistake, and I will show you someone who is not doing anything to improve your organization." Snuffing out a team member's knack for creative thinking and risk-taking means you can probably expect a lot less innovation from that person in the future. Communicate clearly and regularly. An easy one for me, I hope -- being as transparent as possible is something I strive for in running Bad Timing Records, and something I'll extend to my new managerial role. Communicating regularly arms your team with necessary knowledge to make good decisions and keeps them from making uneducated guesses, which can happen when you leave people in the dark. Manage "up" as often as you manage "down". Used in quotation marks because I hate this sort of wording, but it is what it is. Figuring out which rules are worth breaking for the greater good is important. But it's also important to enforce rules that you might not agree with. If you break rules even after your boss has stressed them, it shows your employees that they're free to break your rules when they even slightly disagree with them as well. Everyone should break rules -- like taking risks -- with moderation, and with much thought. "It’s important that you not undermine your superiors. In any organization, your people need to know that you support your chain of command. If they see you freelancing, they will feel free not to support you when they disagree with your policies." Trust and praise your people. Everyone's here for a reason. The folks working with the same external clients each day will know best what they need to do to make those clients happy and drive success -- it isn't safe to assume that you'll know better than them because you're their leader. The same way your success will make your boss look good, the success of people on your team will make you look good. And, when your people succeed, make sure you praise them in front of everyone you can -- your boss, their peers, and whoever else is within earshot. "Show me a manager who ignores the power of praise, and I will show you a lousy manager. Praise is infinitely more productive than punishment—could anything be clearer? But how many managers give this fact more than lip service? How many really live it? Not enough." Cross-train at every position. This is something that a former manager of mine stressed, and something I intend to enforce as soon as I can within my own team. If only one person knows how to operate a certain tool within your team, and they haven't written those instructions down, then what happens when that tool needs a critical fix and that person is on vacation? I want to get my team cross-trained in a way that two people can do everything, then three. This takes time, but I hope to make it a priority. "When I took command of Benfold, I discovered that the usual policy was to have only one crew member able to perform each job: one job, one person. As a result, we were one-deep in just about every critical position. In effect, I was held hostage by the key people on the ship. If they left for any reason, I would have to scramble to get the job done, and probably not done well. It was very disconcerting. I started training backups right away, and kept at it for my entire two years aboard Benfold." These are relatively broad, but still semi-relatively specific priorities. My hope is that abiding by these goals will make for an overall climate of acceptance amongst my team, and encourage them to constantly seek out the best results possible in each situation. I also want to encourage them to learn as much as they can -- a culture of testing and learning means that each individual person can gain data points that are then shared amongst the whole team, allowing the team to become exponentially more competent. As I grow as a first-time manager, I also want to make each member of my team a self-starter -- totally self-sustaining in their own day-to-day work, and capable of helping the entire team by going above and beyond regularly. Not feeling the need to ask for permission, but feeling the desire to create solutions where they see problems. And through this, I want everyone (my team, my peers and my bosses) to understand that I care more about our team's performance and their individual success more than I care about continuing to climb in my own career. This will also, I hope, lead to a tight-knit group that no one wants to leave. Of course, in a city like New York, there are a lot of media and marketing-based jobs -- and I'd never fault anyone in our digital organization for leaving the company for an opportunity that either better aligns with their interests or, frankly, pays them more money. But Abrashoff underlies the importance of a high retention rate (it's worth keeping in mind that the numbers he pulls here are probably quite old now, but I think it's still relevant): "Like the Navy, the business community has to figure out how to help people grow. A Gallup study found that when people leave their companies, 65 percent of them are actually leaving their managers. As true in the Navy as it is in business, leaders are failing—and the costs are astounding. Conservative estimates put the cost of losing a trained worker at one and a half times the annual salary of the outgoing employee, as measured by lost productivity and recruiting and training costs for the replacement." I learned a lot from this book and would recommend it to other first-time managers. Although Abrashoff can seem boasty at times, that likely just comes with the territory of writing a book about your own success. I'm glad I read this one on my Kindle, too -- the notes are easily accessible and I think they'll provide me with a sort of alignment when I need some inspiration or a reminder. It's Your Ship: Management Techniques From the Best Damn Ship In the Navy is available as an IRL book and an e-book on Amazon. It's also available on Audible; if you click this link, you can get a free trial of Audible that includes two free audiobooks. Even if you cancel your trial, you'll get to keep these two books. Also: clicking on any of the Amazon links in this post, and purchasing something from them, provides a small percentage kickback to the author of the blog you just read.